BG18 Series Bar graph Indicators can be mounted either vertically or horizontally and provide a dynamic analog visualization of any type of process parameter that can be transmitted to the indicator via process voltage or current input. BG18 Series indicators have large, bright, 30-segment LED bargraph displays that are particularly well suited for applications where readings must be taken at a distance. All models include a scale for vertical mounting. To mount horizontally a horizontal scale must be purchased spearately. 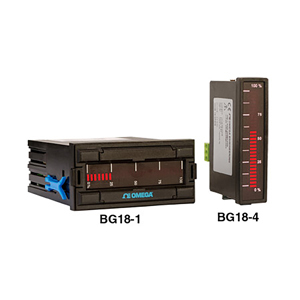 참고: Standard power supply for BG18-4 and BG18-5 is 16 to 30 Vdc non-isolated.